Easter changed everything. The incredible story of the death and resurrection of Jesus shaped history as we know it, and continues to dramatically change lives today. We invite you to join us at CityReach Baptist Church (on the Cedar College campus) for one of our Good Friday services on Friday April 19, at 9am or 11am, and also on Resurrection Sunday, April 21, at 9am or 11am. 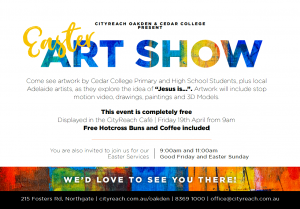 All are welcome – invite your friends and family, we would love to join with us we celebrate the resurrection of Jesus, and the life and freedom He brings.